If it rains, activities at Quiet Waters Park will be cancelled. Instead, we will have some activities at Jing Ying Institute starting at 10:00am. You can call 410-431-5200 after 9:30 to get updates. Saturday, April 30, 2005 is the date of the 7th annual World Tai Chi & Qigong Day. This year, the Jing Ying Institute has arranged for free workshops and demonstrations at Quiet Waters Park in Annapolis. In preparation for World Tai Chi/Qigong day and to help promote information about Tai Chi, the Jing Ying Institute will also offer two free 90 minute Tai Chi workshops on Friday, April 22 at 7:30 pm and on Wednesday April 27 at 6:30 pm. 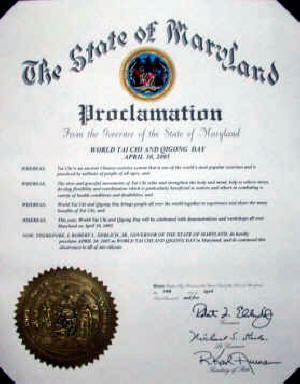 Governor Ehrlich has recognized World Tai Chi & Qigong Day in Maryland with an official proclamation!